Diane Gardner guest starred on the Vroom Vroom Veer podcast with show host Jeff Smith. 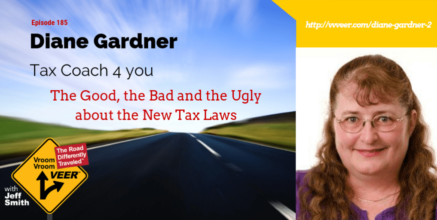 On this episode, we review the changes to the Alternative Minimum Tax, changes to the Itemized deductions, and much more! GET YOUR FREE "Stop Overpaying" Download Bundle! Complete the form below to receive your FREE copies of the first 2 Chapters of my book 'Stop Overpaying Your Taxes' Plus a great bonus! BOOK CHAPTER: Who's REALLY In Charge Of Your Checkbook? PLUS A BONUS SURVEY! : How Much Do You Know About Your Taxes? 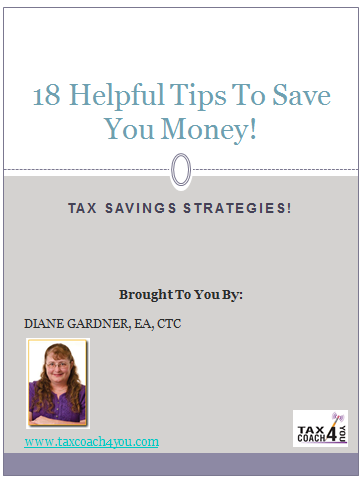 CLAIM YOUR FREE REPORT 18 Helpful Tips To Save You Money! Complete the form below to receive your Report on 18 Helpful Tips To Save You Money! Website Designed & Developed by Design Formare Inc.